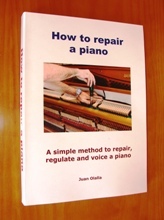 These two books teach you in an easy and simple way all you need to know to tune pianos aurally, also to regulate, voicing and repair the vast majority of faults you can encounter on a piano. Most people think than repairing and tuning a piano is a very difficult task, a job that can only to be carried out by people of the trade. The reality is quite different, providing that you follow the right teaching method, you can learn to tune and repair pianos in a relatively short period of time. 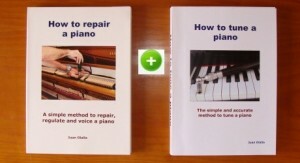 Buy these two books now and learn in no time to efficiently tune and repair your own piano. "How to repair a piano"
Is the inclusion of abundant audio-visual material. The student not only read and see the plentiful descriptive colour pictures, but also hear the mp3 sound files which are embedded in the book. The e-books are well organized and complete. Although I am not a professional musician, I learned a lot about the art of piano tuning and piano mechanics. I have a much better appreciation for what is going on “under the hood” to make those piano strings resonate harmoniously. The engineer in me would have just wanted to tune each string to its standard theoretical frequency. Now I understand why that is not a good idea and why using your ears is so important to the process. The books are user friendly with recorded sound examples to guide the reader, and the explanations are clear even if English is not the author’s first language. Dear Juan, I found your book excellent, It is very comprehensive and covers all that a beginner would need to know. Overall it is beautifully presented and I find no fault with it at all. The photographs are very clear and are more than useful to the explanations in the text. It makes me feel confident to have a go myself. Buy the two eBooks Now and save a 15% - Instant download! Due to proven easy and fast piano tuning methods like “How to tune a piano” nowadays increasingly more people tune their own piano. The benefits for doing so are well clear. Read the following reasons. Just imagine the amount of money that you will save over the years if you tune and service your own piano. 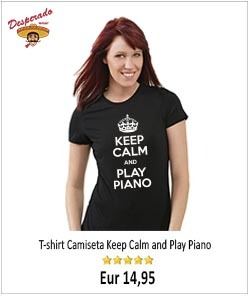 For the price of a single piano tuning, you can buy a piano tuning method like “How to tune a piano” and also a reasonably good quality tuning lever with mutes, that’s all you need to start tuning your own piano, and will probably be the last money you spend in piano tunings. Although the first reason for tuning your own piano, Money! seems pretty convincing, the number one benefit that you will get from learning to tune your own piano is having the piano always perfectly tuned. Have your tuning lever at hand and keep your piano always in shape by touching up the tuning between professional visits, or if so you wish, tune the entire keyboard right from scratch. For most people, the way a piano works is a total mystery, even professional players or teachers don’t have a clear idea of how the piano works. 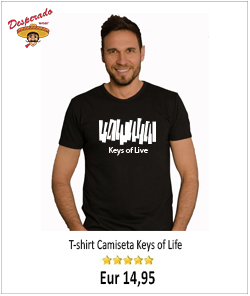 Knowing and understanding the mechanical aspects of your instrument and been able to tune it and service it, will greatly increase your understanding and appreciation of the instrument and will enhance your skills as a piano player. People in general regard piano tuning as a very rare ability only within the capabilities of a gifted few. The reality is well different, piano tuning is not even a music skill, but a mechanical one within the reach of most people. If you can tune your piano you will be no doubt admired by friends and other fellow musicians who will certainly regard you as “smart”. 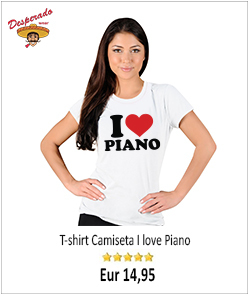 5 Tune not only your piano but also other people pianos. I can assure you, as soon as people (friends, neighbours, etc.) know that you can tune pianos, in no time they will start calling you (that is the way I started my business many years ago). Of course, you can and should charge for your work, so you could convert your hobby in a part time profitable activity that you could combine with your job or studies. The author of these works knows from personal experience the difficulties that someone with the desire to learn can find. I never have liked the secrecy that has always surrounded this trade, and the little inclination that piano tuners in general have to share their knowledge. These eBooks represent a new approach, a simple and fast, step by step method. Can I really tune and repair my own piano? Yes, you can. There are many people who for a variety of reasons want to learn piano tuning and repairing, but the complications of ordinary methods, make the task little less than impossible. It’s a fact that most malfunctions on the piano are easier to mend than they look at first sight. Good observation skills and a good dose of patience backed with a minimun theoretical knowledge is about all you need. These digital books are designed to learn how to tune and repair pianos the quickest and easiest possible way. You learn step by step as if you have a teacher next, focussing only on the elements really important. The experience of three decades tuning and servicing pianos squeezed into two simple and practical methods. The price of each book is $29.95 USD, and if you buy the two books $50.92 USD (15% discount). Clicking on “buy now” you will be redirected to PayPal where you will be able to pay safely by credit card or bank transfer. Once the payment has been accepted, you will recieve an email with a link to download the book. The whole process doesn’t take more than a few minutes. Is it safe to pay transactions online by PayPal? It is completely safe. PayPal is the company leader for payments online, having more than 250 millions clients. The data in your credit card are encrypted and the seller does not keep any information from it. Buy with confidence. 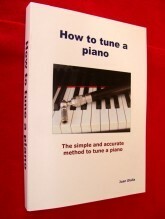 The author of this book is a professional piano technician with over 30 years experience. Having work most of his professional career in England and Spain, nowadays Juan shares his time between his job as a piano technician and teaching of piano technology. Can I really learn to tune and repair pianos with these books? Yes, nowadays two thirds of the people who learn to tune and repair pianos, they do it by their own means. A piano tuning method like “How to tune a piano” and “How to repair a piano” makes the whole process of learning, simple and easy, not fuss, straight to the point. With this book, any adult person with some basic musical concepts, can learn to professionally tune and repair pianos in a relatively short period of time. Is the inclusion of audio visual material. The student not only reads, but also listens and learns by the mp3 files inserted in the book. This way you will soon be able to accurately identify and judge the pulses and beat rates needed to tune a piano. Can I print these books ? Yes, once you’ve downloaded the book and saved it in your computer, you can print it in order to have a copy for your personal use. Have you got any questions/comments to make about these books? Please, let us Know. “Step 1. Tune F33 taking as reference the A37(-)”. Why A37? We have not tuned the A37 yet, or have we? First note we tuned by the fork was the A49 (A4). Thank you for buying the books. The first thing to do when building the temperament is tuning A49 (440 htz) by the fork or any other device capable to produce that pitch. Then taking A49 as reference you tuned A37. These two notes will be in tuned when they do not produce any beats. Then you can start with Step 1 Tune F33 taking as reference the A37 (already in tune). When I look at a sample from your books to listen to the MP3 file, I don’t hear anything when I click on it. My cursor doesn’t change when I point over the arrow as it should when there is something to click on. I don’t know if I will be able to hear the MP3 if I download and order the entire book. Any ideas? Download the latest version XI (11.0.10) and install it in your computer, then you will have no problem with the mp3 samples. If the problem persists do not doubt to contact me again.